Overlooking rolling countryside Unity Cottage is a beautifully renovated single story barn conversion offering a perfect touring base with easy access to beaches, towns and theme parks, an ideal place to explore the whole county of Cornwall. With stunning views over the Poldice Valley near Chacewater, the three bedroom semi-detached cottage was once used to store carts and tractors and has been sympathetically converted to keep its exposed beamed ceilings, mellow external stonework and granite doorsteps. Unity Cottage has a light, sunny kitchen with patio doors opening out onto a decked area which in turn looks over the valley. There is a small paved/pebbled garden area tucked away to the side of the property which although is not totally private is an added space to enjoy the far reaching views and maybe fire up a BBQ. From here, there is also access to a large unsupervised trampoline if relaxing and taking in the view is just not enough! A wood burning stove in the open-plan living/dining room adds to the oil fired underfloor heating to provide warmth during the chilly autumnal and winter nights. The main bedroom has a kingsize bed and an en-suite shower room with WC and basin. The family bathroom has a bath with thermostatically controlled shower over, WC, basin and heated towel rail. There are two further bedrooms a Twin and a Single both with characters features such as exposed beams and vaulted ceilings. Walkers will be delighted with the myriad of public footpaths and bridleways running near to the cottage - especially the popular coast to coast cycle track which passes within half a mile of the cottage on its way from Devron Creek to Porthtreath Harbour. If you enjoy cycling, bikes can be hired to explore the tramway at Bissoe Cycle Hire, three miles from the cottage. The village of Chacewater, one mile away, has a choice of two traditional pubs, a small selection of shops, a fish and chip shop, playing field, bowling green and a doctors surgery. Unity Cottage is also a perfect base for exploring further afield. Truro just 6 miles away, has an intriguing and eclectic mix of art galleries, bars, restaurants, nightclubs as well as a cinema, theatre, cathedral and museum, making it a year round destination. A city steeped in history and awe inspiring architecture, there is plenty to see and do. Whether you are keen to shop, dine with friends, visit the gardens, an event or simply meander through the Georgian streets, a holiday to Cornwall is not complete without a trip into its capital city. Unity Cottage is just 6 miles from the long sandy beach at Porthtowan, 7 miles from the quaint village of St Agnes and 8 miles from either the maritime capital of Cornwall - Falmouth on the south coast or Perranporth on the north. Accommodation: Ground floor: One step into the open-plan living/dining room with woodburning stove, dining table and chairs, CD Player and TV with freeview and DVD. Two Steps with handrail down into the kitchen with electric oven and hob, microwave, fridge/freezer, dishwasher, and washer/dryer. Bedroom 1 with Kingsize bed and en-suite shower room, WC and basin. Bedroom 2 with Twin beds, Bedroom 3 with one single bed, Bathroom with shower over bath, WC, Basin and heated towel rail. There is parking facilities for two cars but more may be possible by prior agreement. Pets are more than welcome but will need to be happy to meet our 2 miniature horses and Lilly our young Cockerpoo! On arrival we supply Scones, Clotted cream, Jam and butter along with a pint of milk, tea and coffee so you can get your stay off to a good start with a fresh Cornish Cream Tea. If your still peckish after that, a fresh Pasty is available locally to really fill you up. We also provide a complimentary basket of logs for the fire and extra bags can be purchased on site if you run out. Please feel free to contact us if you have any questions at all. Maybe you have a strange and unusual pet or you have 5 adults and a baby, whatever the question, just ask and we will do our best to be as accommodating as possible and try and make Unity Cottage right for your stay in our gorgeous county of Cornwall. I live here with my husband Dave and two children Eliie (20) and Sam (12). We have 2 American miniature Horses, who are stabled here at the property. Please feel free to ask me anything about the cottage, I might be able to make it the right place for you to have a wonderful holiday in our gorgeous county of Cornwall. Complimentary basket of firewood is supplied and further bags are available to purchase on site. Paved garden area, ideal for BBQ's. Access to Trampoline in our garden. Decking overlooking the Poldice Valley. Very sunny. Unity Cottage has the benefit of 'Fresh Cornish Spring Water' on tap (Bore hole/Well water) It is very fresh and tasty and is UV treated but in line with regulations we advise anyone making baby milk to use bottled water. This is obviously advisory and it is the guests choice if they are comfortable using it. Fabulous cottage and wonderful hosts! We had such a fabulous time. The cottage is perfect! Karyn has thought of everything you could possibly need. When we arrived there was a cream tea and even Mollie our springer spaniel had been left doggie treats! It’s an ideal location for touring Cornwall and then relaxing in the evening, staring out at beautiful countryside, glass of wine, log burner... perfect! We don’t want to say too much as we want to book for 2019! What a wonderful couple and Mollie the bouncy Springer. We loved having you guys here. We are glad you had a great time and we all look forward to seeing you again. We stayed at Unity cottage for the week leading up to our son starting university in Penryn. Karyn, the owner, greeted us when we arrived and showed us around. We had had high expectations of the cottage as the pictures looked so good, but we were even more impressed when we got to see it properly. It had everything that we needed and you could see that a lot of effort had gone into its conversion. Everyone had their own room which was great for us as a family and being able to bring our dog made it even more perfect. Karyn had left scones, clotted cream, jam, milk etc for us which was a really nice touch and most appreciated and enjoyed after our 5+ hour journey. We really couldn't have asked for more. The location was perfect too and there were lots of nice walks for our dog, although he wasn't too sure about the cows and on the first full day I envisaged us having to continually have the blinds closed so he couldn't see them, but he did start to get used to them after some time. Seeing the cows on a daily basis was a reminder that we were right in the middle of the country which was great as we're so used to being next to the sea, so it was a lovely change. Karyn was the perfect host and went out of her way to make us all feel at home and was there for anything we might have needed. Will we visit there again? Most definitely! I would highly recommend the cottage to anyone, although please don't book when we want to go! The cottage was very good and the layout was well thought out. The rooms actually seemed bigger than I thought they would be and easily accomodated us all (3 adults and two teenagers). The owners were very friendly and supplied a very nice welcome pack of scones etc. Would very much recommend this cottage. Very friendly family, Thank you for booking our cottage and we hope to see you again in the future. We had two weeks in Cornwall staying at Unity Cottage and we were so impressed with the cottage which was spotless and had every amenity and appliance you could have asked for along with a beautiful view. Karyn was a fantastic host,very friendly, and even greeted us with scones, jam and clotted cream. The cottage is in an ideal spot to visit all the beautiful beaches, harbours, castles and not forgetting shopping and we did all of that. I must not forget the lovely miniature horses and the little swift chicks in the stables which you have to say hello to along with an excitable but lovable cockapoo. Needless to say we will be coming back Karyn and cannot recommend you and your cottage enough, my daughter was even going to barricade herself in and claim squatters rights!!! Wonderful cottage with fantastic views. Great location for exploring Cornwall. Perfect. Karyn was really helpful and friendly. She had even provided an afternoon tea for our arrival which was an unexpected treat. The cottage has 3 good sized bedrooms and the open plan kitchen/living/dining was spacious and light, with the benefit of outdoor space as well. We loved the location - it provided a great base for exploring Devon, north, south and west coasts all within easy reach, yet we were based in a tranquil location with stunning views over the local landscape. To top it all, a very dog friendly place, so we could bring our furry friend with us. A perfect get away holiday cottage, supplied with everything we needed. If only we had booked a fortnight instead of a week!!!! Highly recommended and would definitely return. Thank you for a wonderful stay, Karyn. A cream tea awaited us on arrival .Karyn explained a few things and we met Lily the cockerpoo . Really well equipped kitchen , comfy beds and powerful showers. Perfectly located , shopping in Truro and then easy to get to all the places we wanted to visit . It’s so peaceful which is just what we like. Also met the gorgeous Angel and Babs , the miniature American horses and they are too cute ,Karyn was happy to tell us all about them and our grandson loved them. Perfect hosts , there if you needs them but otherwise let us get on with it. We will definitely go back. 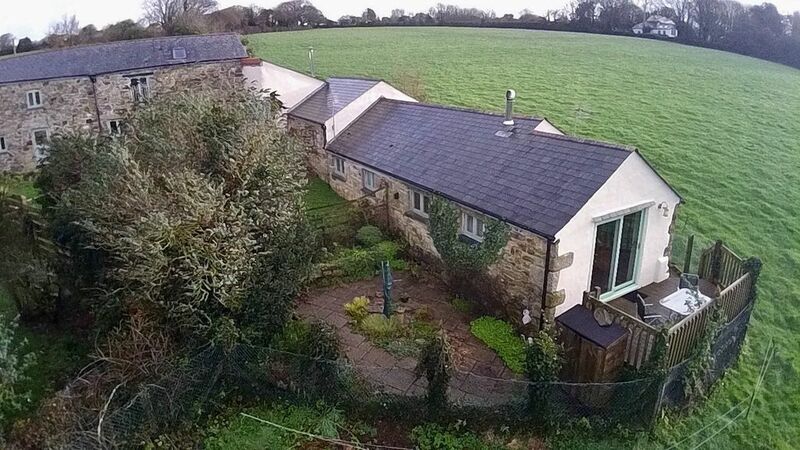 Centrally located in rural location overlooking the Police Valley in Cornwall. Lots of places to walk locally with easy access by car/taxi/bus to all main towns and beaches. Nowhere is too far from Unity Cottage. Please note.... Whist every care has been taken to ensure the Cottage is as safe as possible for all visitors and guests, the owner can not be held liable for any injuries whatsoever, however caused, during the rental period. It is the responsibility of the renter to ensure they are adequately covered through holiday insurance for any losses incurred through injury or accident during the rental period.